Text-based digital prints installed in the windows of For The Thundercloud Generation in Edgewater, Chicago. 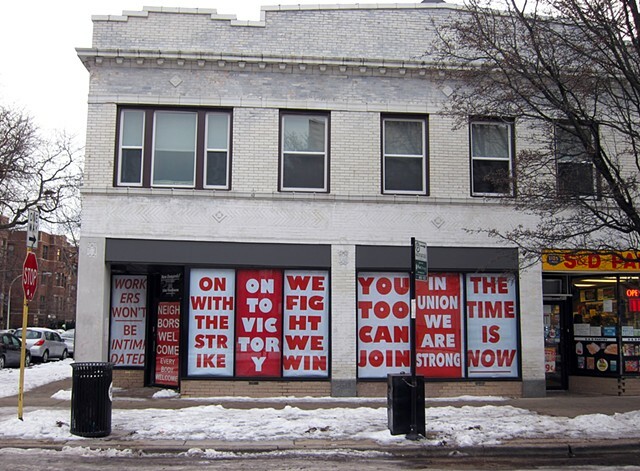 This window-based work uses slogans and demands of the Ladies' International Garment Workers' Union (ILGWU) spanning a roughly 80-year period, from 1895 through 1982. Most of the slogans are adapted from flyers, broadsheets, and strike announcements produced by the Union. They were used as part of local and national ILGWU campaigns for the right to freedom of association, collective bargaining, a regulated work day and work week, vacation and overtime pay, improved workplace health and safety, and health care and retirement benefits for workers in the garment industry. Based on archival research conducted on-site at the ILGWU archives at the ILR School at Cornell University, in June 2015. Twelve digital prints on paper, custom sized to fit windows ranging from 35 by 76 inches to 46 by 90 inches. Installed at For The Thundercloud Generation, 1104 West Berwyn street, Chicago.